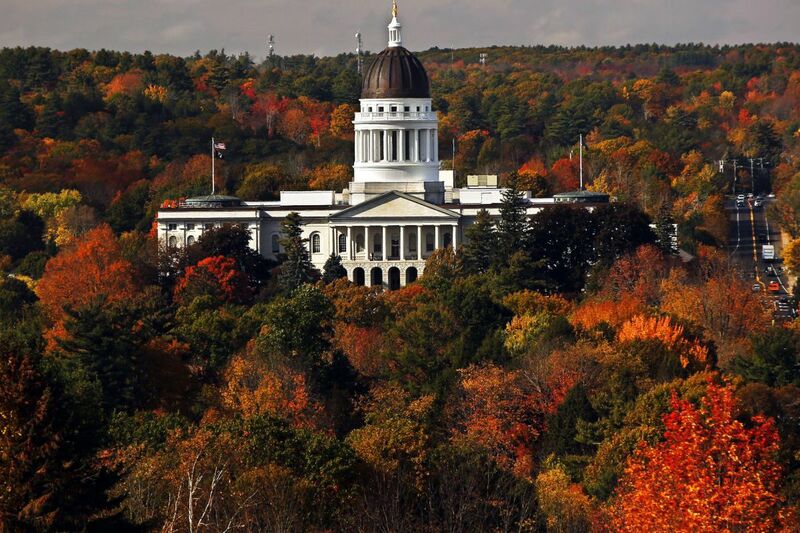 Fall foliage surrounds the statehouse in Augusta, Maine. We’re still waiting. If you're wondering whatever happened to the 2017 fall foliage season, you haven't missed it. Around the Philadelphia area, the annual show is one to two weeks behind, Ryan Reed, the foliage expert at the Pennsylvania Department of Conservation and Natural Resources reported Thursday. The reason is the obvious: A run of radically above-normal temperatures. "The warm temperatures certainly have extended the season and slowed the transition throughout the state," he said. Cool nights are a sine qua non for producing the chemical reactions that coax leaf color out of hiding. But the average overnight low in Philadelphia this month is 57.6. Overall, through Wednesday October temperatures averaged 7.6 degrees above normal, and this month was likely to become the second or third warmest October on record, said Mike Silva, lead forecaster at the Mount Holly National Weather Service. The trend has been evident throughout the state, and throughout the Northeast fall tourist zones. Scranton's October readings were running 8.9 degrees above normal; Binghamton, N.Y., 7.5; Worcester, Mass., 8.6, and Burlington, Vt., an astonishing 10.7. The warmth is tied to widespread dryness. In its Thursday update, the U.S. Drought Monitor has Philadelphia, its Pennsylvania collar counties, and the eastern portions of its New Jersey neighbors all are in the government's "abnormally dry" zone. Parts of New England are in moderate drought. The dryness situation could change during the weekend, and so will the foliage situation – eventually.